Friday, the night was humid and hazy and the seeing was terrible. But with beers in hand, Kevin braved the mosquitoes and set up our scopes in his back yard to make an evening of astrophotography. Thin clouds were blowing through and the atmosphere was very turbulent. I didn’t really expect a great result, but Kevin wanted to test his new scope and I was determined to get some pics after failing to get anything useful our previous time out. Everywhere I look, I see stunning photos of galaxies, clusters, and nebulae. Occasionally, you get a constellation image and stunning widefield images of the Milky Way. Most of the time, it’s pictures of the ethereal beauty of deep space objects. Honestly, I can see the appeal. I mean, what photographer wouldn’t want to capture such exquisite beauty, right? And I’m as guilty as the next person for doing so. This time, I thought I would do something a bit different and try photographing a star instead. Under the sky conditions at the time, it seemed like it would be the only thing I could get a decent image of anyway. And when you can photograph 1, why not get 2 in the form of a double star? 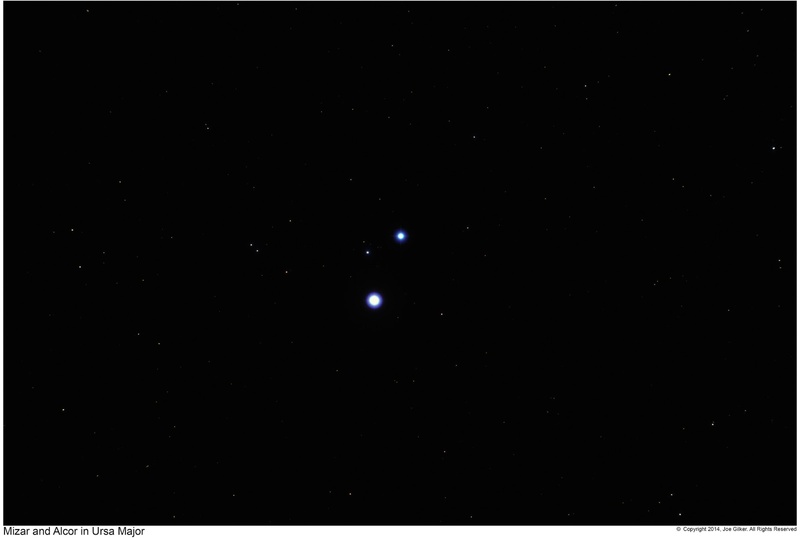 So I chose the Mizar / Alcor pair, since it’s just too obvious and a usually overlooked target. According to the Wikipedia article: “Mizar (Zeta Ursae Majoris, Zeta UMa, ζ Ursae Majoris, ζ UMa) in Arabic known as “سها” is a quadruple system of two binary stars in the constellation Ursa Major and is the second star from the end of the Big Dipper’s handle. Its apparent magnitude is 2.23 and its spectral class is A1V. Mizar’s name comes from the Arabic مئزر mīzar, meaning a waistband or girdle.“This is a beautiful pair that can be seen with the naked eye by people with average eyesight. Most never notice that it’s a multiple star until it’s pointed out to them, but once they know, they can easily see it. Through binoculars or a telescope, the separation of the 2 is very apparent. And it’s a nice sight to see. And suddenly, the sky cleared up of clouds. It was still terribly humid and the seeing was poor, but I figured I’d try a shot at some deep space goodness. 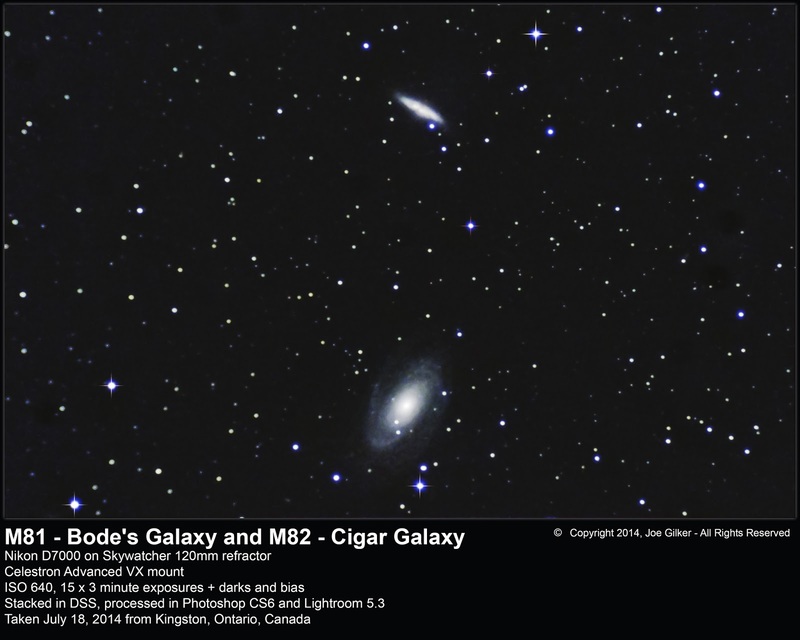 Since I was into shooting doubles, I thought I would swing the scope southeast 20º or so and try to catch the deep space pair of Bode’s Galaxy (M81) and the Cigar Galaxy (M82). In an 8″ SCT, I can only get a single of the objects in frame, but with my trusty 120mm Skywatcher wide angle refractor, I was able to frame them both very nicely with my Nikon D7000 attached. I honestly didn’t expect much with deep sky shots. But I still managed to get a great shot of this pair. Deep sky imaging from city suburbs is an iffy practice at best. Luckily, I like right at the northern edge of the city, so light pollution in the northern sky isn’t quite as bad as when I aim south. So I’m hoping to get more of these under better conditions. This will be top of my list next time I go out to the Dark Sky Viewing Area. Till next time, clear skies to all.